Kecubung. This flower are generally found on most home garden in indonesia, has so many efficacy in traditional medicines. 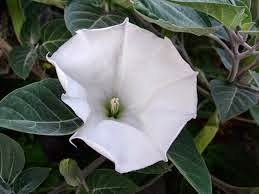 Latin Name: Datura metel L.
Habitat: It grows wild in the woods and in the garden. Description of the plant: Plant stems of woody shrubs, tall form bent rods can reach 1.5 m. Branching stretched wide and usually towards one side only. Leaves opposite, rounded shape bercangap. The flowers are trumpet-shaped purple or white. The fruit is a round box prickly, brown seeds many flat round. Chemical constituents: Alkaloids (skopolamina, hiosiamina, atropine); flavonoids. Simplesia Name: Flos albae Daturae. Amethyst 1 piece of fruit; Zaitun/Olive oil or coconut oil, the fruit is crushed amethyst delicate contents removed and mixed with oil was then put back on its container then heated briefly until the oil is hot; then squeezed with a cloth, oil dripping out we use for ear pain. Amethyst leaves some strands; A little coconut oil, knead, squeeze Put the leaves in the stomach. Amethyst leaves (dried) 7 strands; 5 tablespoons of coconut oil, Enter in the bottle and cap; then heated in the sun for 7 days, Applied to the scalp 2 times a day; morning; afternoon. 14 strands of amethyst fresh leaves; 10 tablespoons of coconut oil, amethyst leaves chopped and dried then added coconut oil, save the mixture for 3 days. Squeeze and then warmed separate oil, rub on the painful part; when necessary; add a little eucalyptus oil. 14 strands of amethyst leaves; Lemongrass (finely chopped) 2 pieces; 2 cups coconut oil, boiled mixture was then stored overnight in a closed place. The mixture was separated; warmed oil, rub on the painful.